These larger meeting recording systems are for capturing and transcribing speech from multiple participants in boardroom meetings, city council meetings, courtrooms, hearings, seminars, expert panels and focus groups. 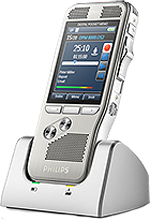 A lightweight, portable, modular four-channel transcription and recording system that includes four microphones and the Start-Stop 4-Channel Transcriber. 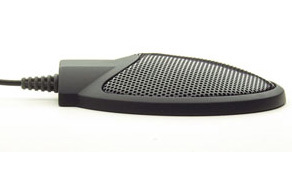 Lightweight, portable, and designed for small to medium size conference rooms. 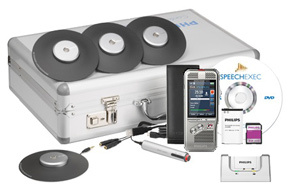 This is a low-cost turn-key recording and transcription kit. 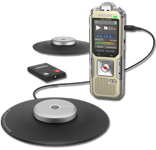 Our custom designed Secure Wireless Four-Channel recording and transcription system is adaptable and ideal for courtrooms, convention centers, and boardrooms. 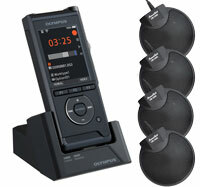 It includes the Start-Stop® 4-Channel Transcriber. 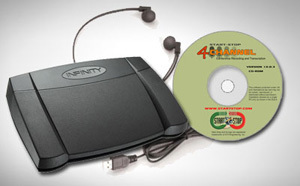 Our new most portable wireless conference recording and transcription system that is custom designed by our engineers. This board meeting recording system fits in a case that is easily wheeled and stored no matter whether you are traveling via auto, airplane, or train. 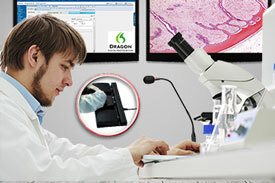 Optional Dragon Re-dictation Package speeds up transcript preparation by a factor of 2 or more. 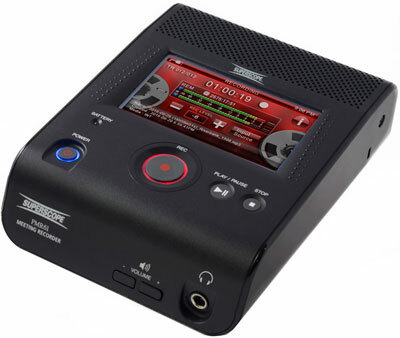 Our new portable digital conference recording and transcription kit is a custom designed Four-Channel system engineered to capture all voices, including the audience/podium. 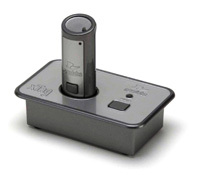 This meeting recording device system is portable, adaptable, and ideal for city councils and boardrooms. 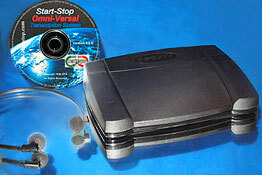 It includes the Start-Stop® Universal Transcriber. No PC required during recording session. An excellent choice for those who need to easily transcribe, send to a transcriptionist, or Speech Recognition Software. Can be used to continuously record in MP3 format. 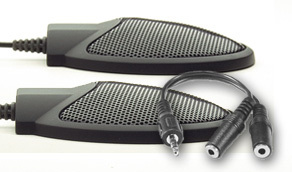 Lithium Ion battery ensures that if the power goes out, the recording can continue. 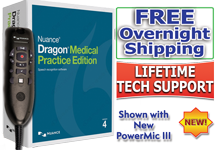 This meeting recorder software integrates easily with Nuance® Dragon Professional, Legal, and Medical software. 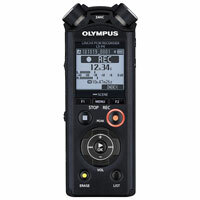 Ready to go conference recording kit from Olympus. 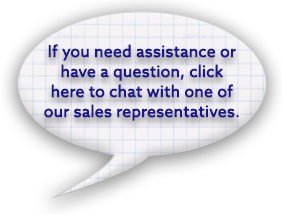 Send recordings to a transcriptionist or Speech Recognition Software. 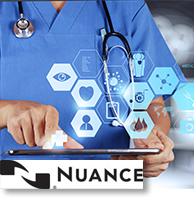 Integrates easily with Nuance® Dragon Professional, Legal, and Medical software. Comes with convenient protective carrying case. 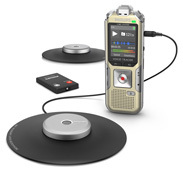 These conference voice recorders are unique in that they record in stereo, often with high quality microphones and the ability to record in high fidelity audio files, such as WAV, MP3, and WAV. The Tresmic three microphone system delivers unmatched clarity. 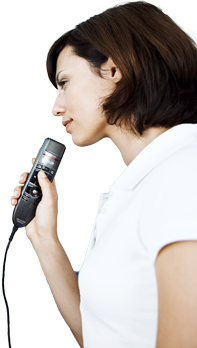 The Superscope PMR61 is probably one of the most advanced recorders available today, but it is also one of the most easy to use. 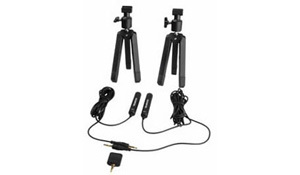 These external microphones give your handheld digital recorder extended reach and coverage. 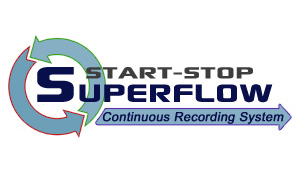 Exceptional conference recording at a fraction of the price. 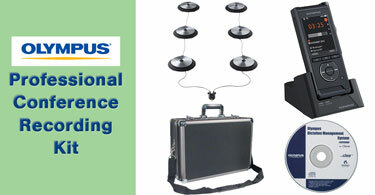 Save with the CM-1000 Conference Kit. 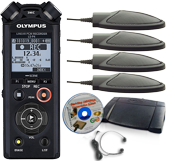 External microphone kit for Olympus stereo recorders. 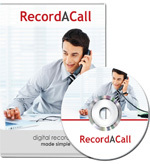 Record telephone conversations easily and simply on your PC. Includes a license USB dongle that allows you to take it with you. 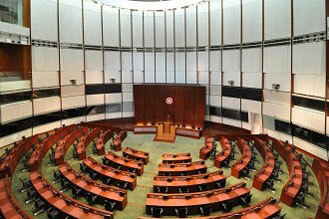 Useful for law enforcement, government agencies, brokerage houses, telemarketing centers, legal, medical, application. 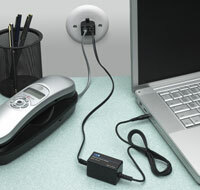 Compatible with popular telephone recording adapters. Record long meetings and transcribe in near real-time.